A sci-fi cover that actually depicts something from the story? Whatever next? If anything, this book is proof that advertising works when you do it long enough. 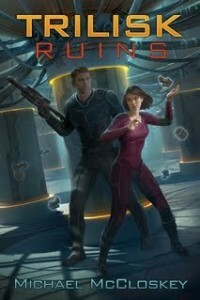 I originally picked up an eBook copy of The Trilisk Ruins (Parker Interstellar Travels, book 1) because I had seen its cover used in Google adverts all over the Internet. It’s an intriguing cover and it actually does have something to do with the story, which is more than I can say for a lot of books these days (mine included, I’m sorry to say). The story itself is an interesting one presenting several fresh ideas, as well as putting an interesting and modern spin on the old spacefaring rogues theme. The corrupt and overly bureaucratic government is strangling the progression of the human race and causing more problems than it is solving. This is not because it is an evil entity but instead because it’s lost sight of what it is supposed to be doing. It’s a wonderfully underused reason for siding with the criminal element, so it’s nice to see a different perspective on old tropes. There are two different alien races in this story: the titular Trilisks, who are long dead and whose star empire has left ruins for our xenoarcheologist main character to rummage through, and the Gorgala. Despite these two races being present, aliens are apparently rare in the Trilisk universe, so the arrival of the Gorgalan “Shiney” is a major plot element in the later half of the novel. The book takes its title from the main setting of the first half of the story. Here we have alien architecture that really ramps up the alien aspect. Are they in a prison? A lab? An experiment gone wrong? Or is this something else entirely and the only people who could explain it are long dead? Your guess is as good as mine because the book doesn’t try to explain the utterly alien mindset of the Trilisks – and that’s a good thing. All too often sci-fi explains alien motivations and thought processes as if they are just another kind of human being and in doing so, the aliens lose a lot of what makes them appealing. That doesn’t happen here; the aliens stay alien. That said, not everything is great about this book. There are a lot of situations where a character will think about something, then immediately tell a nearby person what we just read them think. It’s clumsy and repetitive – we only need that information presented to us once. If the character was saying the opposite to what they were thinking then by all means give us both the thoughts and the speech, but aside from that we don’t need the same thing repeating. Characterisation is also a little thin on the ground. McCloskey has made a decent go at making our two primary human characters, the unemployed xenoarcheologist Telisa and the mercenary Magnus. However, they do both sound and act very similarly at several points through the story, which makes it difficult to follow who is saying what at times. That said, the story flows very nicely and the use of a limited cast really helps to keep the reader focussed on the plight of the main characters. The Trilisk Ruins is a fun read and as the first in a series, it introduces the Parker Interstellar Travels universe in a very enjoyable way.